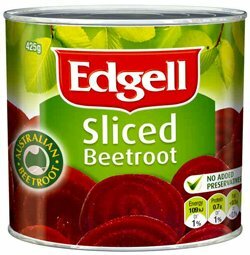 Edgell Sliced Beetroot. Slices of juicy beetroot, perfect for in sandwiches, burgers, salads and barbeques. Beetroot is fat free and a good natural source of fibres and antioxidants. Beetroot (61%), Water, Sugar, Food Acid (Ascetic), Salt.